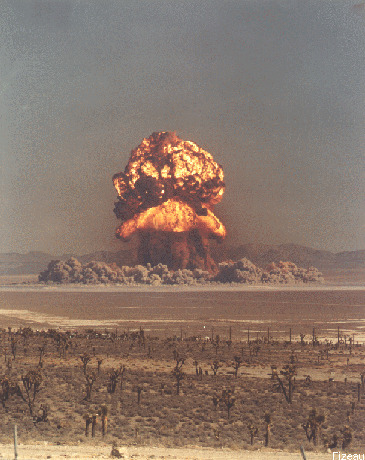 Operation Plumbbob was conducted at the Nevada Test Site (NTS) from May through October of 1957. It was the sixth test series at NTS and consisted of 29 tests. Six of these were safety tests, and two did not produce any nuclear yield. 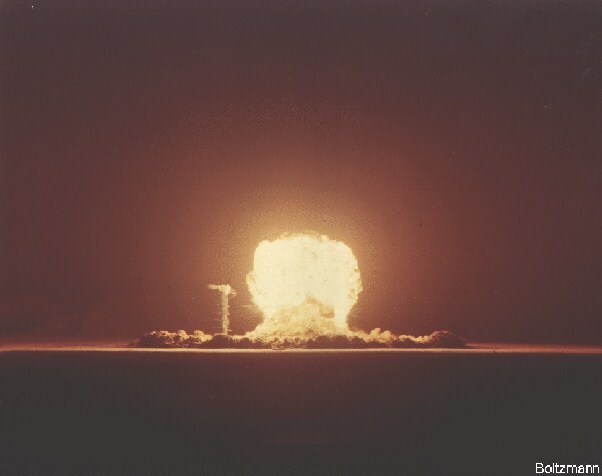 This series addressed several objectives, including tactical weapon proof tests, safety tests, and component and mockup testing for thermonuclear systems to be detonated in Hardtack I, among other things. During Plumbbob 16,000 DOD personnel participated in the Desert Rock VII and VIII exercises. 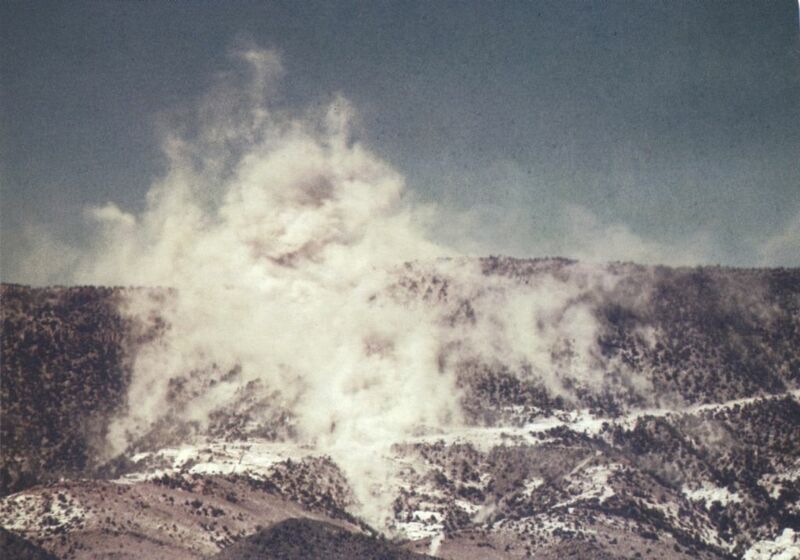 The LASL shots were named for deceased scientists, the UCRL shots were named for North American mountains. Plumbbob released some 58,300 kilocuries of radioiodine (I-131) into the atmosphere. This was more than twice as much as any other continental test series. This produced total civilian radiation exposures amounting to 120 million person-rads of thyroid tissue exposure (about 32% of all exposure due to continental nuclear tests). This can be expected to eventually cause about 38,000 cases of thyroid cancer, leading to some 1900 deaths. Chart of fallout exposures from Plumbbob. From National Cancer Institute Study Estimating Thyroid Doses of I-131 Received by Americans From Nevada Atmospheric Nuclear Bomb Test, 1997. Go to the National Cancer Institute and get the full report. 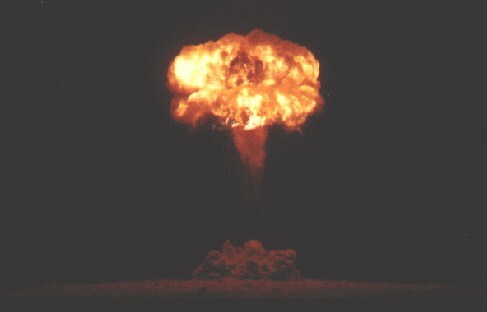 XW-40 light weight boosted fission warhead test. The device, developed by Los Alamos Scientific Laboratory (LASL), weighed 295 lb (total weight), the nuclear system by itself weighed 144.6 lb. Device width 18 inches, length 31.6 inches. The shot cab held 9 tons of sand, and 15 tons of paraffin as instrument shielding. Predicted yield was 11 kt. This LASL test was a fizzle, yielding only 7% of its predicted 2 kt yield. This was a test of the XW-30 warhead. The device was a boosted all-oralloy fission design. The diameter of the device was 20.8 inches, length 38.4 inches, and the nuclear system weight was 303.8 lb (total device weight 448 lb). 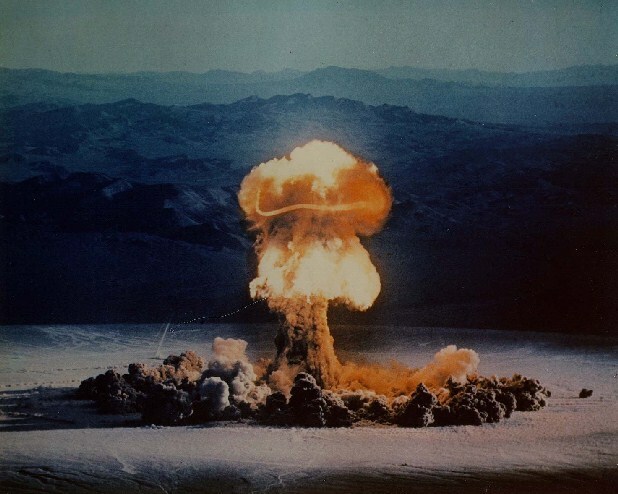 A modified and enlarged version with more fissile material in the core and a different combination of high explosives was successfully retested in Franklin Prime. The picture below was identified as "Franklin" but may actually be "Franklin Prime". 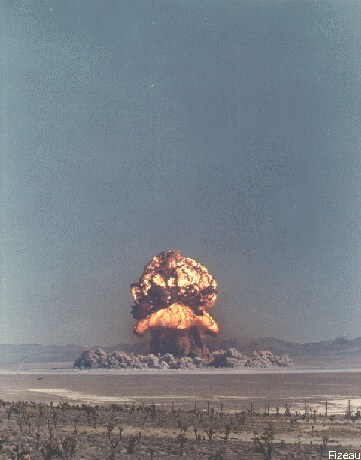 Priscilla was a weapons effects test sponsored by the DOD using a stockpiled device of known yield. The device used was a LASL designed Mk-15/39 boosted primary similar to that tested in Redwing Lacrosse. The predicted yield was 40 kt, the same as in the Lacrosse test, but the actual yield was slightly lower. The test device weighed 581.4 lb total (nuclear system weight was 542 lb). It was 27.1 inches in diameter, and was 27.1 inches long. Don't these images of Priscilla look a lot like the images Upshot-Knothole Grable? They should. They are pictures of Upshot-Knothole Grable! What are they doing here labelled "Priscilla"? All of these images were obtained from DOE sources and were identified as being Priscilla! It appears that images of Grable have been misidentified as being Priscilla by the DOE and AEC for many, many years. I don't have any images that I believe are authentic Priscilla pictures, but it is reasonable to suppose that the two shots had a rather similar appearance. 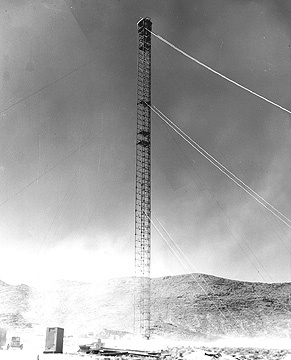 They were both NTS daytime airbursts in the 10-40 kt range, and their scaled burst heights were almost identical. At some time in the past sets of Grable pictures must have been misidentified as being Priscilla, and presumably the security surrounding the handling of the original films have made it difficult to go back and compare them to catch the error. This is a recent picture of a railroad bridge that was 1,800 feet from Priscilla ground zero and was subjected to overpressures exceeding 450 psi, severely distorting the interior structural girders. 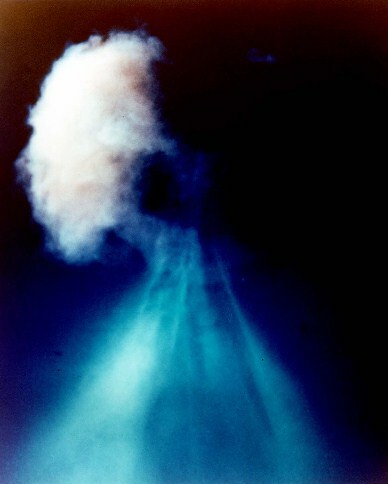 Hood was the largest atmospheric test ever conducted at NTS (and in continental U.S.). 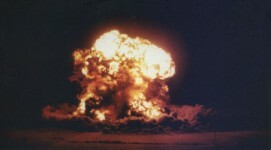 This was a test of a two-stage thermonuclear device designed by UCRL (University of California Radiation Laboratory), even though the U.S. government stated at the time that no thermonuclear tests were being conducted in Nevada. The design was intended to fill a gap in 300-400 lb. 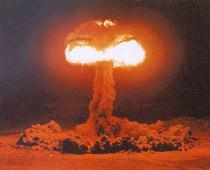 thermonuclear warhead technology, and was tested at reduced yield. The predicted yield was 60-80 kt. 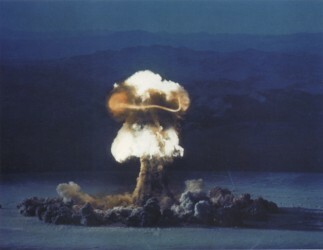 The device used a boosted Swan primary (which gave yields of 12-19 kt in other tests during Plumbbob). About 7 kt of the overall yield was from fusion. The device was a small diameter system (12.1 inches) and was 42.2 inches long. Total device weight was 393 lb. The test also included troop maneuvers by 2500 Marines, and air operations by 124 aircraft. 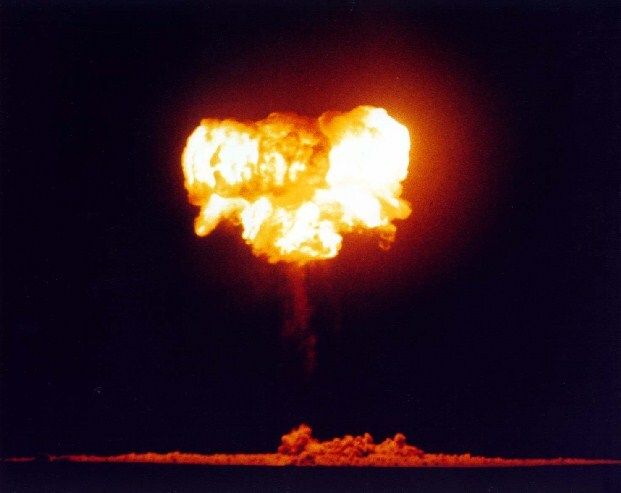 This was a UCRL developmental test of a two stage thermonuclear design. A boosted Swan primary was fired in a mockup of the thermonuclear system. The predicted yield was 11-15 kt, the secondary stage contributed to the total yield. This device was very similar to the Shasta test device. A full yield test of this device was intended for Hardtack I in 1958, and it may be related to the similarly dimensioned Hardtack I Cedar device which produced 220 kt. The diameter of this device was 16.2 inches, length 68.4 inches, and its total weight was 1352 lb. This was a combination proof test of the Genie (AIR-2A) nuclear air-to-air rocket, and an effects test of the Genie W-25 warhead. The unguided Genie rocket was fired from a F-89J. The rocket travelled 4240 meters in 4.5 seconds (about Mach 3) after release before detonating. The predicted yield was 1.7 kt. 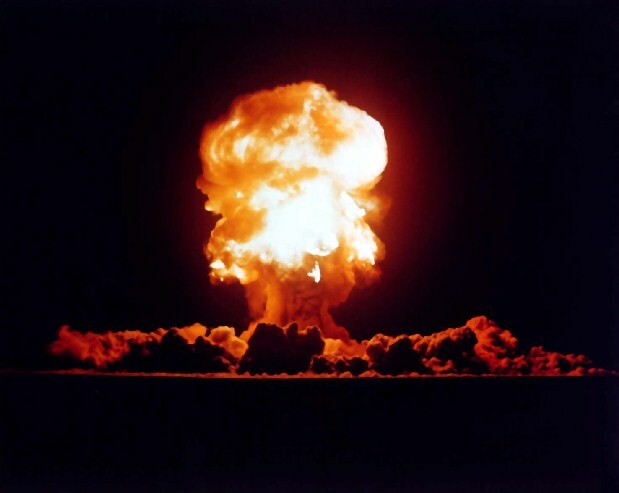 The plutonium core W-25 (probably with a depleted uranium tamper) had a diameter of 17.35 inches, a length of 25.74 inches, and weighed 221 lb. LASL ICBM warhead development test. 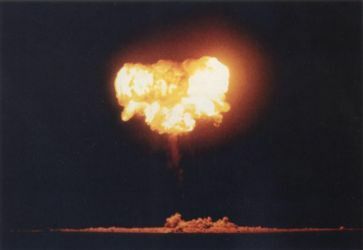 Probable test of XW-35 primary in thermonuclear mockup. 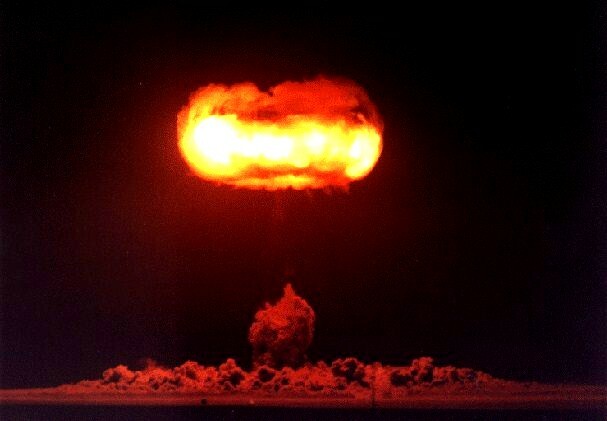 Similar to Hardtack I Koa device (which was tested at 1.37 Mt in 1958). Kepler had a predicted yield of 11 kt. The device had a diameter of 28.5 inches, and a length of 44 inches. The primary weighed 64.4 lb, the total device weight was 1517 lb. 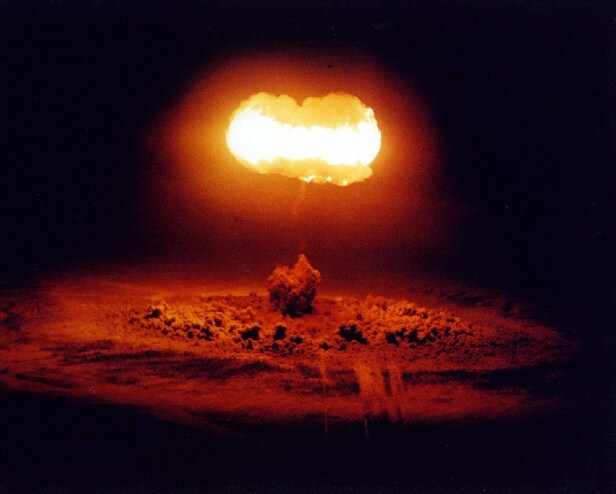 The Pascal-A test occupies a significant place in the history of nuclear testing since it was the first test to be that could be called a contained underground test. Pascal-A (originally named Galileo-A) was a one-point safety test, an attempt to verify a primary design that would have a small maximum energy release if accidentally detonated. 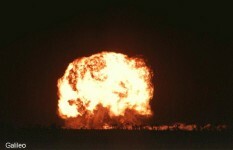 Accidental detonations can only initiate the detonation at one location instead of the multi-point initiation of a deliberately fired multi-detonator system, hence the concept of the "one point safe" criterion. Even as planned, Pascal-A was unsafe by current safety standards since a nuclear yield of 1-2 lb was expected, compared to current standards of zero yield. But for safety sake, they tested the device near the bottom of a deep open shaft. This was the first US nuclear test to be conducted in an underground shaft, and thus qualifies as the beginning of US underground nuclear testing. 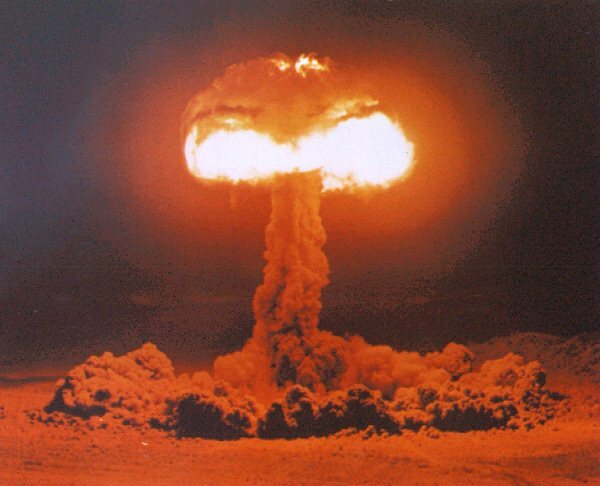 As it happened the test yield was about 50,000 times greater than expected and created a sizable explosion, catching everyone off guard. Official listings of the yield for this shot still describe it only as "slight", even though every other test in Plumbbob has a specific yield published. 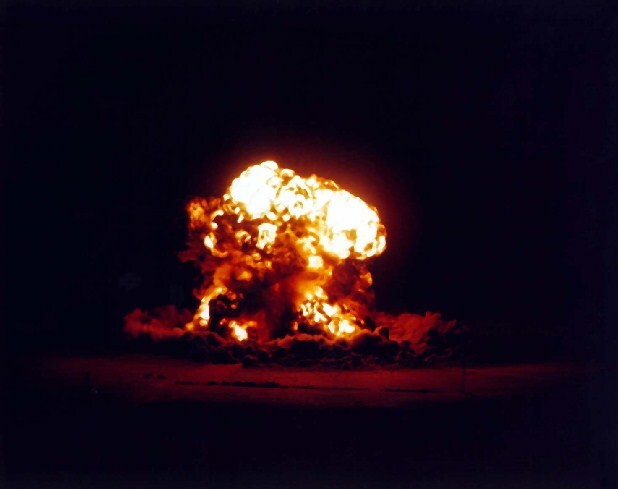 It is possible to calculate the yield though from normalization data given in UCRL-53152 Part 6 Results of Calculations of External Gamma Radiation Exposure Rates from Fallout and the Related Radionuclide Compositions; Operation Plumbbob, 1957 (by Harry G. Hicks, July 1981). This report provides comparative test product information, and if Pascal-A is compared with other low yield (and thus pure fission) tests, a consistent value of 55 tons is obtained. 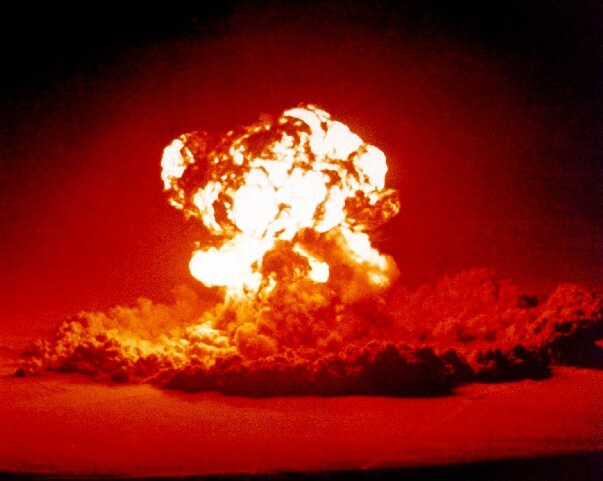 Physicist and test director Robert Campbell and Astrophysicist Robert Brownlee provide a first hand accounts of this test in Caging the Dragon: The Containment of Underground Nuclear Explosions (DOE/NV-388, 1997). Bill Ogle was out there, in that timing station. When he saw that thing come out of the ground he knew he couldn't come south the way he came or he'd get into trouble... He was really excited about how they were going to get back... They were damn lucky they didn't go right through that cloud. Carothers: Why didn't you stem it? Campbell: Didn't need to. We did have a lid on that hole. Nobody's seen it since. We never did find that. On that lid was one of Johnny Malik's detectors, and we wanted a line of sight to see if we could measure some reactions. There was a kind of plug in the hole. It was a couple of hundred feet off the bottom, as I remember. All it was, was a concrete cylinder with a hole through the center of it, so the detector could look through it. And it had an annulus, so it wouldn't bind anywhere going down. It was suspended from the harness that was holding the bomb. It was a collimator, not a plug that was supposed to stem the hole. We never found that collimator either, and it was about five feet thick. But anyhow, bad as it was, spectacular as it was, there was only a tenth of the radiation on the ground around there that there would have been if it had been done on the surface. Bob Brownlee: ... Pascal-B and Pascal-C had plugs, but Pascal-A did not, although it had a concrete collimator in it for the detector on the surface. The guys had been working trying to get it ready, but there had been a number of troubles. They finally got it down the hole, by my recollection, about ten o'clock or so at night. There wasn't much time to go back to Mercury, go to bed, and get up the next morning to shoot it, so somebody said, "Why don't we just shoot it now, and then go in?" And it was the world's finest Roman candle, because at night it was all visible. Blue fire shot hundreds of feet in the air. Everybody was down in the area, and they all jumped in their cars and drove like crazy, not even counting who was there and who came out of the area. [Caging the Dragon, pp. 20-22]. Test of the LASL XW-30 multi-purpose warhead; used in TADM (tactical atomic demolition munition), and Talos SAM (surface-air-missile) warhead. All oralloy (highly enriched uranium) DT gas-boosted system. Predicted yield 10-20 kt. Device diameter 22 inches, length 45.8 inches. Nuclear system weight 317 lb., total device weight 448 lb. 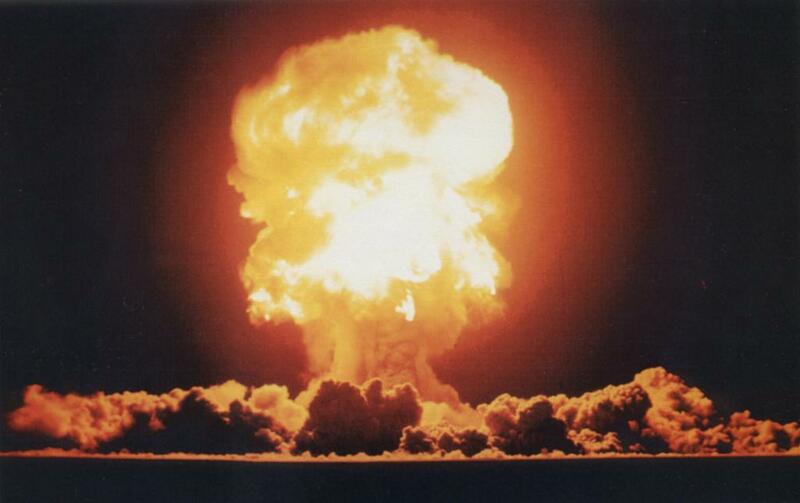 This was a UCRL developmental test of a two stage thermonuclear design. 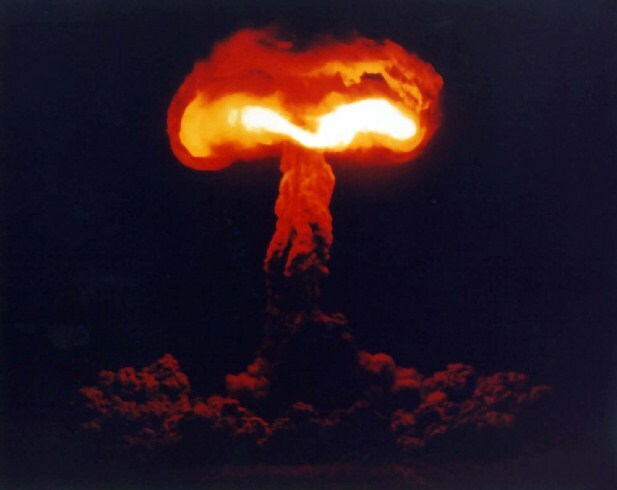 A DT gas boosted Swan primary was fired in a mockup of the thermonuclear system. Shasta was nearly identical to Diablo, except for changes in case materials and pit geometry. Predicted yield was 11-15 kt. Device dimensions were 16.9 inches in diameter and 69.2 inches long. Total device weight was 1435 lb. LASL gas boosted implosion device, possible XW-34 test. Satisfactory performance. Device dimensions: diameter 17 inches, length 26 inches. Nuclear system weight 144.6 lb, total device weight 275 lb. Pascal-B is an interesting footnote to the history of nuclear testing, and surprisingly - spaceflight. The Pascal-B (originally named Galileo-B) was a near duplicate of the Pascal-A shot. It was another one-point criticality safety test, of the same basic primary stage design. Like Pascal-A it was fired in an open (unstemmed) shaft. One significant difference was that it had a concrete plug, similar to the concrete collimator used in Pacscal-A, but this time it was placed just above the device at the bottom of the shaft. The close proximity of this plug to the bomb had an unanticipated side effect. "Every kid who has put a firecracker under a tin can understands the principle of using high explosives to loft an object into space. 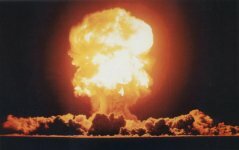 What was novel to scientists at Los Alamos [the atomic laboratory in New Mexico] was the idea of using an atomic bomb as propellant. That strategy was the serendipitous result of an experiment that had gone somewhat awry. 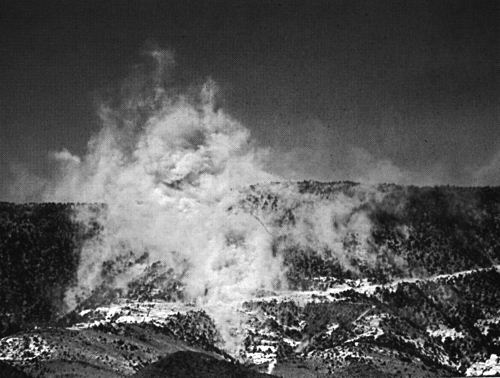 "Project Thunderwell was the inspiration of astrophysicist Bob Brownlee, who in the summer of 1957 was faced with the problem of containing underground an explosion, expected to be equivalent to a few hundred tons of dynamite. 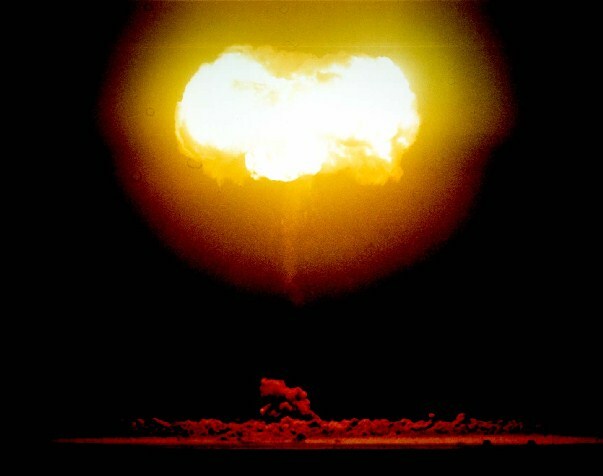 Brownlee put the bomb at the bottom of a 500-foot vertical tunnel in the Nevada desert, sealing the opening with a four-inch thick steel plate weighing several hundred pounds. He knew the lid would be blown off; he didn't know exactly how fast. High-speed cameras caught the giant manhole cover as it began its unscheduled flight into history. 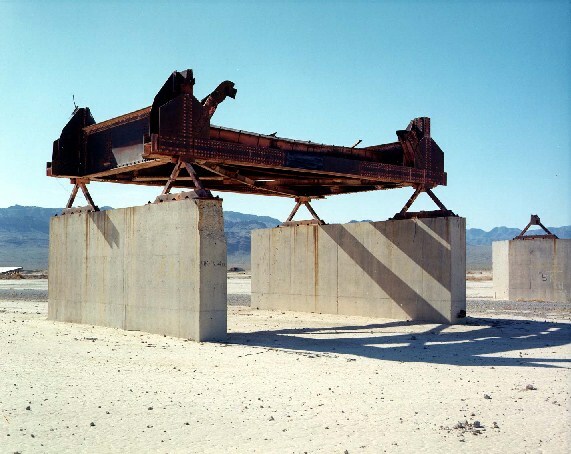 Based upon his calculations and the evidence from the cameras, Brownlee estimated that the steel plate was traveling at a velocity six times that needed to escape Earth's gravity when it soared into the flawless blue Nevada sky. 'We never found it. It was gone,' Brownlee says, a touch of awe in his voice almost 35 years later. "The following October the Soviet Union launched Sputnik, billed as the first man-made object in Earth orbit. Brownlee has never publicly challenged the Soviet's claim. But he has his doubts." Although the shaft test goes unnamed in the article, only two shaft shots were fired before Sputnik was launched on 4 October 1957 - Pascal-A and Pascal-B. The nighttime Pascal-A shot could not have been the shot involved, since notably absent from the accounts of Pascal-A are the dazzlingly brilliant fireball streaking into the heavens that such an object would produce. Also Pascal-B was the only one of the two that was fired in summer as the article describes. 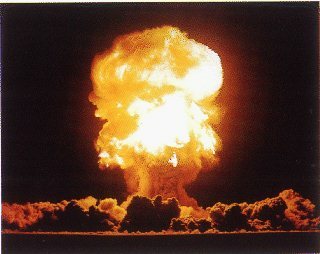 This conclusion was confirmed to the original author by Dr. Robert Brownlee, who has written his own account of this event expressly for the website nuclearweaponsarchive.org. 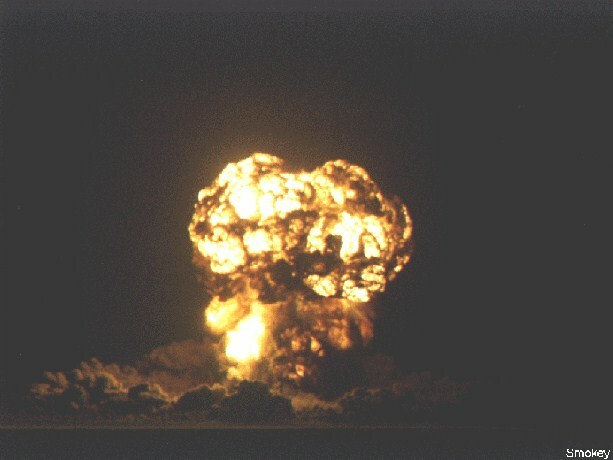 Objects can only be propelled to very high velocities by a nuclear explosion if they are located close to the burst point. 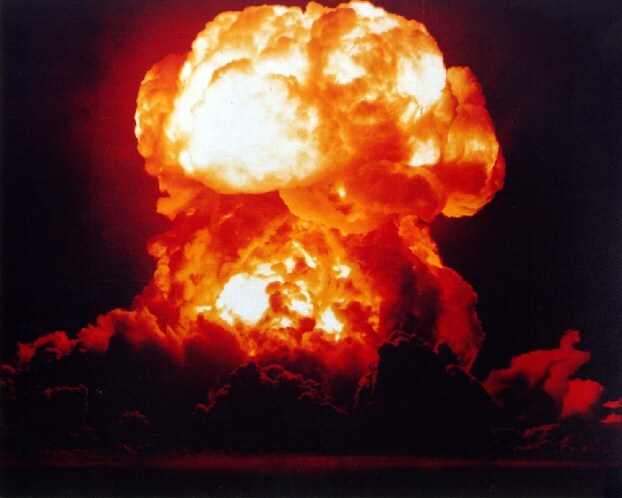 Once a nuclear fireball has grown to a radius that is similar in size to the radius of a quantity of high explosive of similar yield, its energy density is about the same and very high velocities would not be produced. This radius for a 300 ton explosion is 3.5 meters. The steel plate at the top of the shaft was over 150 m from the nuclear device, much too far for it to be propelled to extreme velocity directly by the explosion. The feature of Pascal-B that made this possible was the placement of the collimator close to the device. 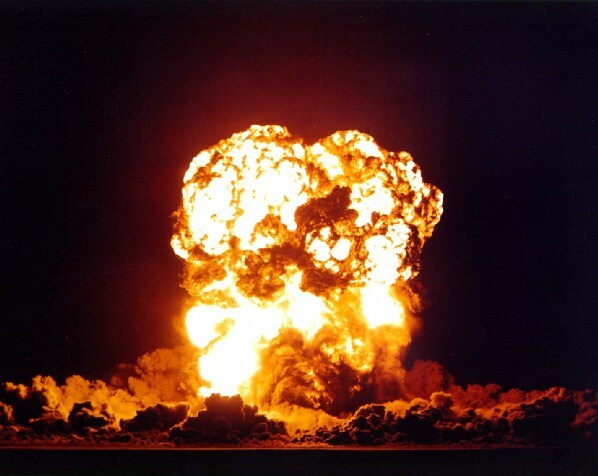 The mass of the collimator cylinder was at least 2 tonnes (if solid) and would have been vaporized by the explosion, turning it into a mass of superheated gas that expanded and accelerated up the shaft, turning it into a giant gun. It was the hypersonic expanding column of vaporized concrete striking the cover plate that propelled it off the shaft at high velocity. To illustrate the physics, and estimate how fast it might have been going, consider that if the collimator absorbed a substantial part of the explosion energy (say a third of it, or 100 tons) it would have been heated to temperatures far higher than any conventional explosive (by a factor of 50 with the previous assumption). This is about five times Earth's 11.2 km/sec escape velocity, quite close to the figure of six times arrived at by Dr. Brownlee in his detailed computations. The fact that the projectile was not found of course is no proof of a successful space launch. The cylinder and cover plate of Pascal-A was also not found, even though no hypersonic projectile was involved. Even speeds typical of ordinary artillery shells can send an object many kilometers, beyond the area of any reasonable search effort. In the mid-80s I heard of a "Project Thunderwell" from someone who had been employed at Livermore. In about 1991, I asked Dr. Lowell Wood about it, who was (and presumably still is) a prominent weapon physicist at Livermore. He told me that it was a project, never actually constructed, to launch a spacecraft on a column of nuclear-heated steam. The idea was that a deep shaft would be dug in the earth and filled with water. A spacecraft would be placed atop this shaft, and a nuclear explosive would be detonated at the bottom. LASL retest of the fizzled Franklin device but with more U-235 added to the gas boosted all-oralloy implosion core. Predicted yield 2 kt. This was a development test of the XW-30 warhead. The Franklin device was enlarged, its diameter increasing from 20.8" to 21.4", and its length increasing from 38.4" to 45.8 in. More oralloy was added to the core. In addition, the combination of PBX 9401 and PBX 9404 used in the device was replaced by a combination of PBX 9010 and PBX 9404. The nuclear system weight was 304 lb. 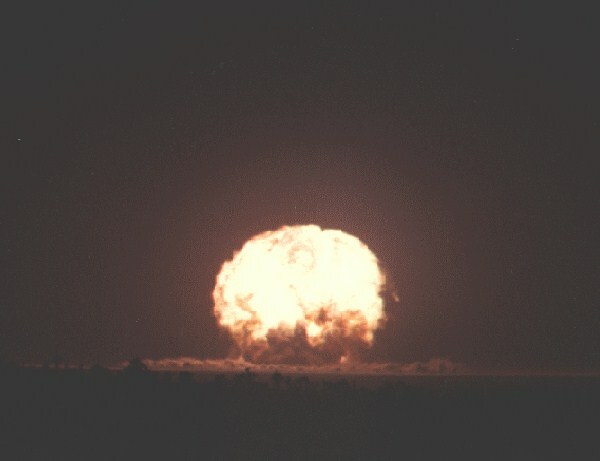 Test of the UCRL TX-41 thermonuclear design. 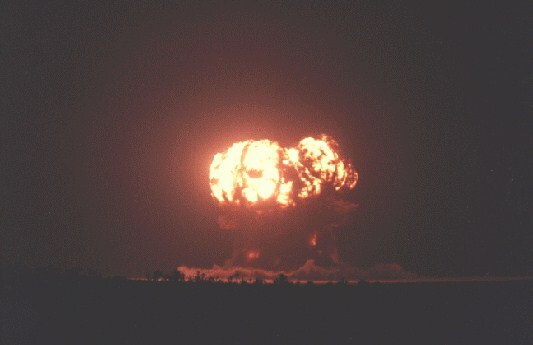 Three stage prototypes of this design were previously fired in Redwing Zuni and Tewa (3.5 Mt and 5 Mt respectively), this test system was reportedly a two stage device, using a boosted primary in a thermonuclear system mockup (perhaps a test of the first two stages of the full three stage design). 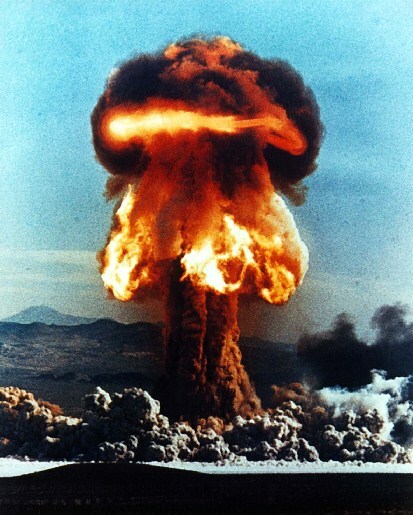 Some thermonuclear yield was produced by secondary. The predicted yield was 45-50 kt. Device dimensions: diameter 50 inches, length 126.2 inches. Device weight 9408 lb. 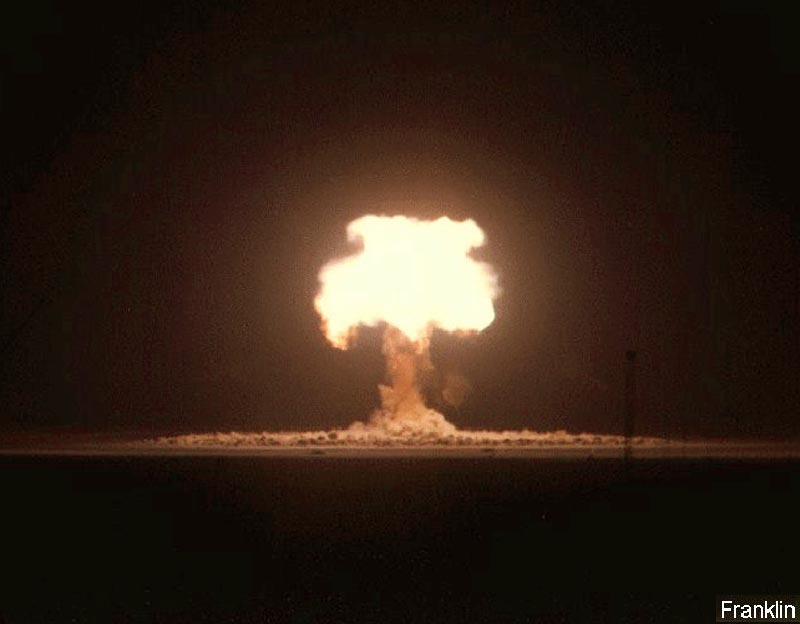 The Mk-41 eventually became the largest yield nuclear weapon ever developed or deployed by the U.S. (25 megatons). It was had the highest yield to weight ratio of any known weapon (about 6 kt/Kg). 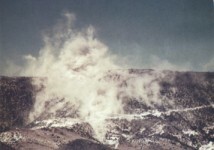 Smoky became notorious in the 1970s due to the radiation exposures received by over three thousand servicemen who were brought in as part of the Desert Rock exercises to conduct maneuvers in the vicinity of ground zero shortly after the test. This led to Congressional inquiries and epidemiological evaluation of the affected veterans. A 1980 study of the 3224 participants found a significantly elevated number of leukemia cases. Ten cases of leukemia were found, compared to the expected base number for a similar unexposed population of four (see Health Effects of Exposure to Low Levels of Ionizing Radiation: BEIR V, 1990, p. 375). LASL diagnostic/exploratory test of boosted fission device. Device dimensions: diameter 12.4 inches, length 60 inches. Total device weight 848 lb. LASL boosted fission device. Possibly a test of the XW-34 depth bomb. Device dimensions: diameter 16 inches, length 31.75 inches. Total device weight 131.3 lb. Predicted yield 8-10 kt. LASL test of XW-31 variant, boosted primary in thermonuclear system mockup. Design yield 50-70 kt. Device dimensions: diameter 28 inches, length 39 inches. Total device weight 1346 lb. UCRL deep underground test shot to evaluate containment and detection of underground nuclear tests. 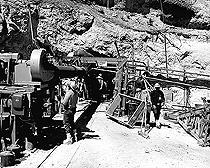 Fired in B-tunnel in side of Ranier Mesa. Modified W-25 warhead used. Device dimensions: diameter 17.4 inches, length 25.7 inches. Device weight 218 lb. 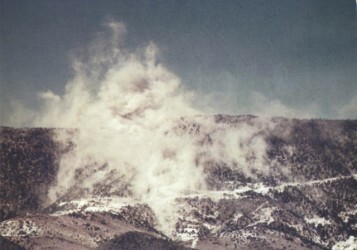 Pictures below show the shot tunnel, and the dust kicked up by the shock wave. The test itself was totally contained. 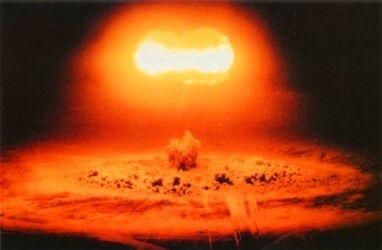 UCRL test of a small "clean" tactical 2-stage thermonuclear device. Device fizzled when second stage failed to fire. Predicted yield was below 50-100 kt. Swan primary used. Device dimensions: diameter 22.4 inches, length 46.6 inches. Total device weight 1225 lb.